Acoustic curtains are generally made of heavy duty, flame retardant fabrics, specially designed and constructed to absorb sound. They can be used with various track systems to afford greater flexibility than fixed sound absorptive panels. Typically used for recording studios, sound sets, dance, drama and music rehearsal spaces, acoustic curtains can be used in venues ranging from schools to theatres. Acoustic curtains are primarily intended for sound absorptive applications, as they offer minimal sound transmission loss. 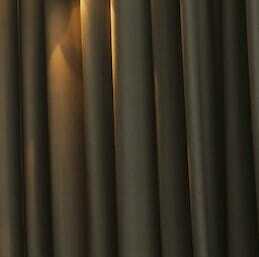 But acoustic curtains have a wide variety of applications apart from absorbing sound. They can be used to cover window areas, to divide spaces, or they can be arranged to cover hard or reflective surfaces, which allows an element of acoustic 'tuning' within a room. Specialty Theatre generally manufactures acoustic curtains from either wool serge or velvet velour, as the heavier nature of these fabrics provides the best acoustic results. Track selection is based on the relevant application and is dependent on curtain size, weight and arrangement.